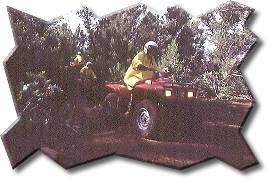 1) All ATV riders acknowledge that the activity is potentially dangerous and will hold East Zion Adventures and Zion Ponderosa Ranch Resort harmless in the event of personal injury. 2) All ATV riders must be at least 16 years old and must show proof of a valid driver's license. 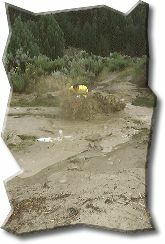 3) Single riding only, multiple riders on one ATV are forbidden. 4) All riders must wear a helmet at all times during the ride. 5) Free riding without the tour guide is forbidden. 6) All riders must follow the tour guide in a single file spaced a minimum of 30 feet apart. 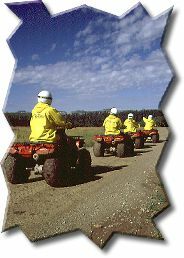 7) Riders must take the responsibility to become aware of the features of the ATV prior to the ride, including locations of brakes, throttle, and ignitions switch. 8) Riders that do not follow the above rules will be required to stop the ATV tour and walk back to the resort. 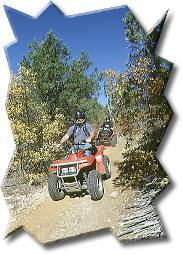 Riders who show reckless intent on ATV tours may also be forbidden from participating in other resort activities. 9) ATV riders will also be liable for any damage to vehicles caused during their ride. 10) ATV riders will be required to acknowledge their agreement and understanding to the above rules in riding prior to beginning the ride. This ride is mainly flat and takes approximately one hour. Riders traverse the plateau that overlooks Checkerboard Mesa in the Park. Many species of natural trees and shrubs line the trail. Riders see Checkerboard Mesa from a number of different views. Photo taking is encouraged. This is an easy ride for beginners and a good warm-up for old timers. cross through the Gulch to the Park fence where they park their ATVs. Guests can then walk the additional 50 yards on foot to the stunning dryfall. This ride is excellent for beginners or more experienced riders and lasts approximately one hour. Pine Knoll up a steep logging road. Plenty of time is taken at the top of the Knoll for some great photo ops! The deep canyons of Zion's Narrows can be viewed to the west, with Checkerboard Mesa to the south and the 10,000-foot peaks of the Dixie National Forrest to the North. The return trip is an exciting, downhill ride and guests must carefully negotiate the trail to keep the ATV on the road and out of trouble. This trail ride is not for beginners but can be enjoyed by anyone who has a few rides under their belt.